How fun are these! 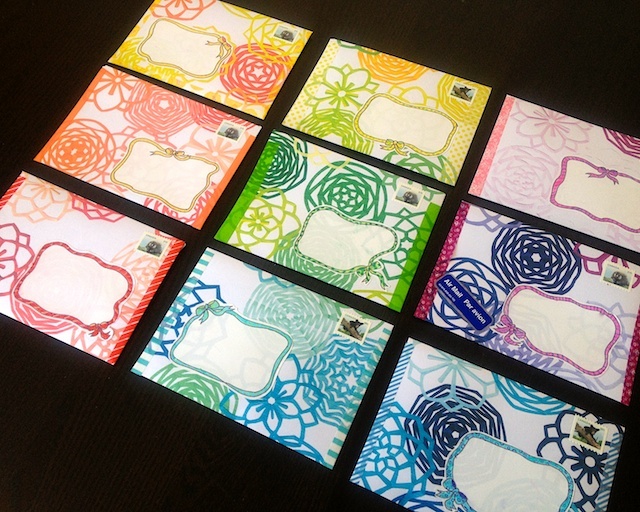 I had the best kind of fun crafting this series of one-of-a-kind envelopes for the Elevated Envelope Exchange. Don't know about The Elevated Envelope? 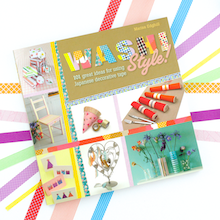 It's a fantastic mail art exchange created by Tara Bliven of Ephemera Press. Find out more here. 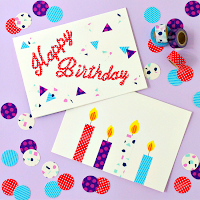 For each envelope, I first created a set of colourful kirigami paper cuts. 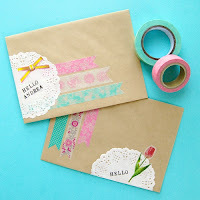 Using an envelope template and a little washi tape. 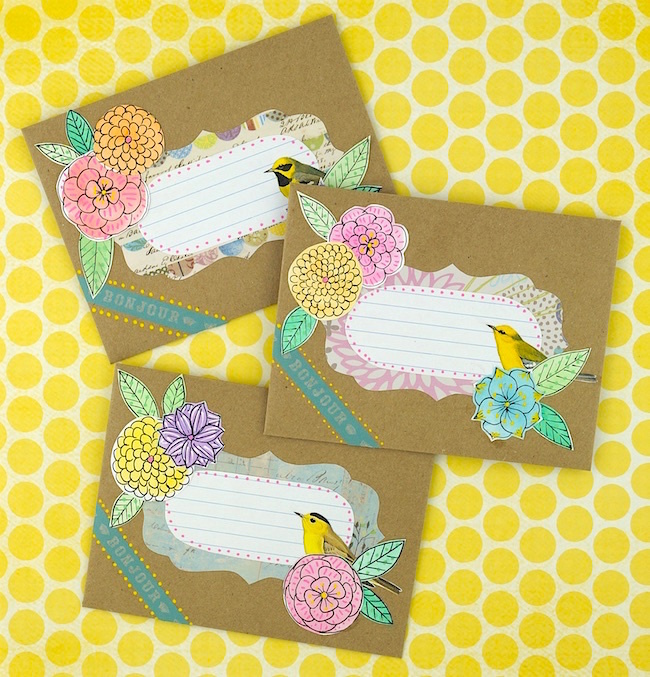 Hand drawn address labels add a touch of whimsy. 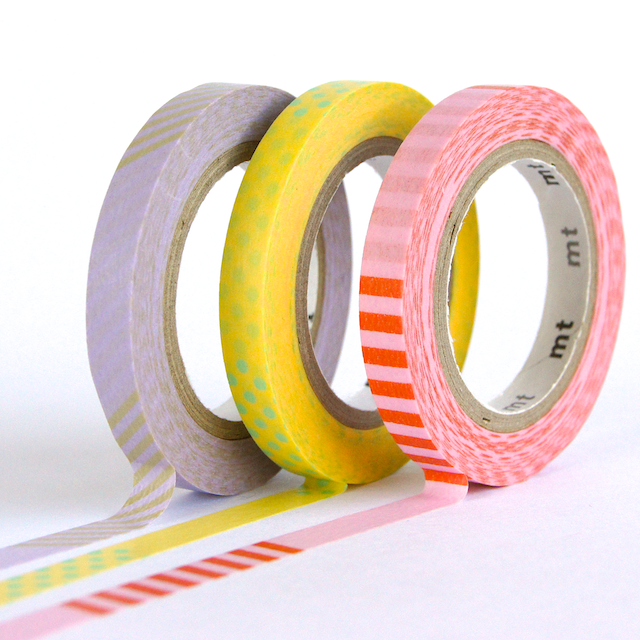 Index cards dressed up with some washi tape (how cute is the mt Bows tape?) 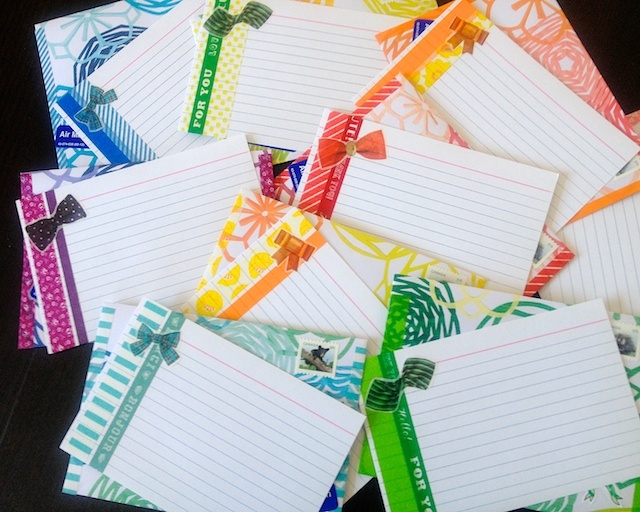 make great coordinating notecards to slip inside. 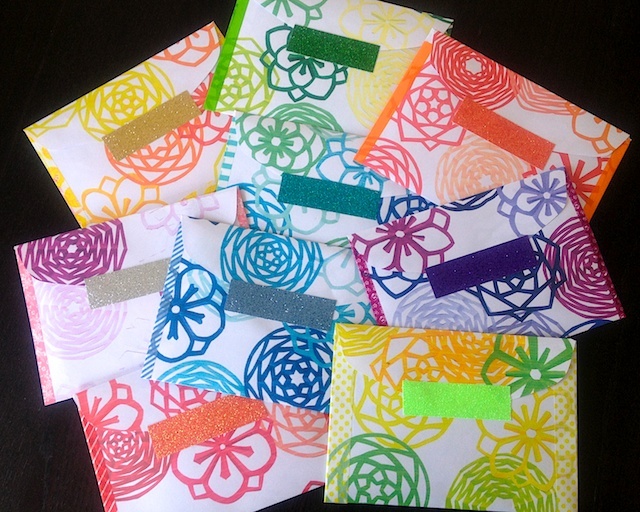 And, for a finishing touch, a strip of glitter tape!Have you ever participated in a mail swap? 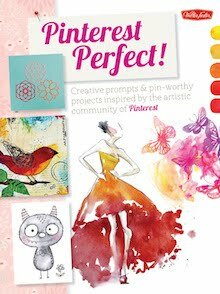 I've found it to be a wonderful creative exercise plus you end up with a mailbox full of pretty things!Want to receive some pretty mail in YOUR mailbox? Send me a note at info@omiyage.ca with your mailing address and a little something about yourself. 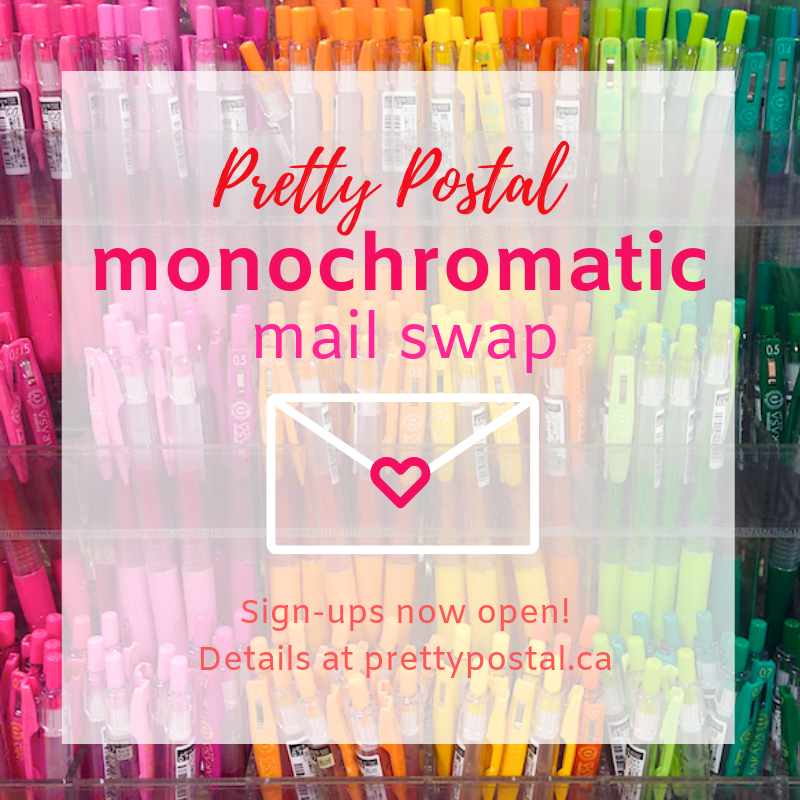 I'll be making a list and choosing new friends to send mail to each month. And don't worry if you don't hear back from me right away - February & March are already full thanks to Mail Swaps. Colour copies = brilliant! 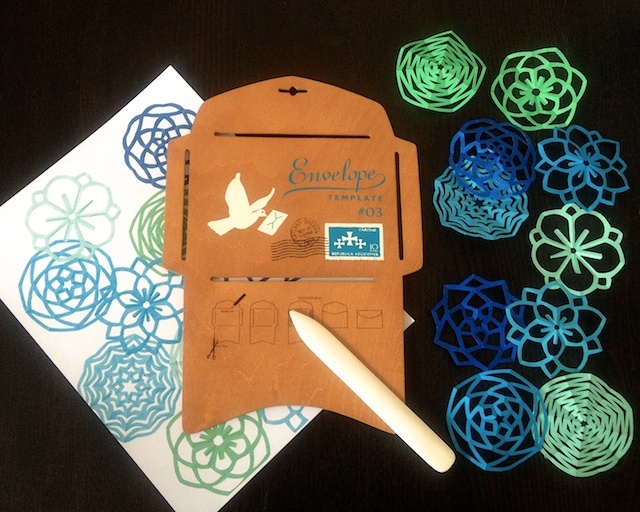 I'd been wondering how you attached those kirigami cutouts when I saw the envelopes on instagram! Thanks Laura! 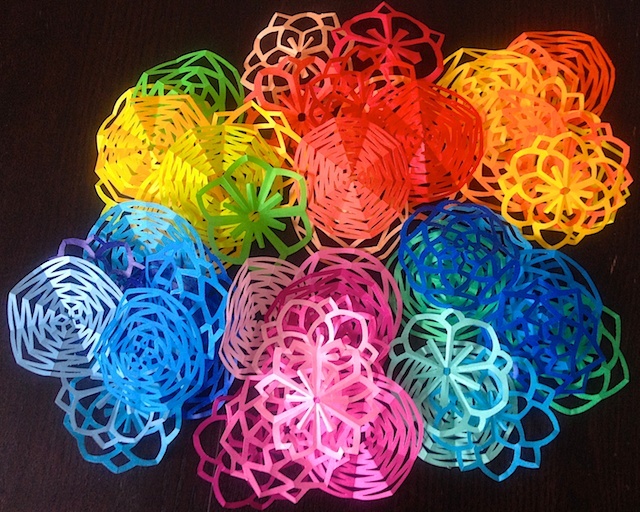 I'm not sure that glued on kirigami would've survived being mailed but the colour copies seemed to do the trick! These are a feast for the eyes. 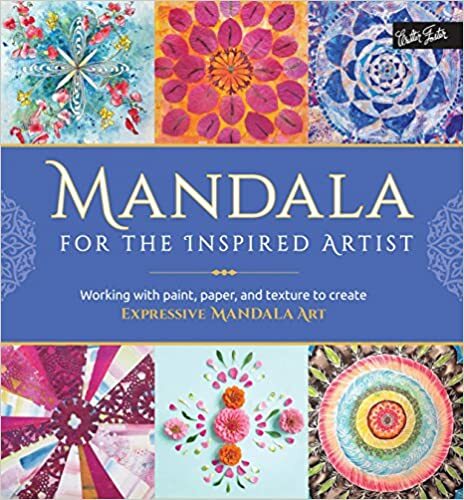 It would be a treat to receive one in the mail. Thanks Tammy! Glad to hear that you like them. 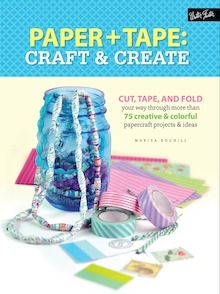 Wow~ awesome ideas!I wonder how to glue those kirigami on the white paper perfectly? Thanks! They aren't glued - I made a colour copy using the Copy function of my desktop printer. Easy! Thanks Sara! I especially love cutting the bows out (just stick it onto a piece of parchment / waxed paper first) to make cute washi tape stickers! I brought in a few of the envelope templates to sell in the store, but they just haven't made it there yet. Oops! Send me an email at info@omiyage.ca if you'd like one and I'll fill you in on the details. 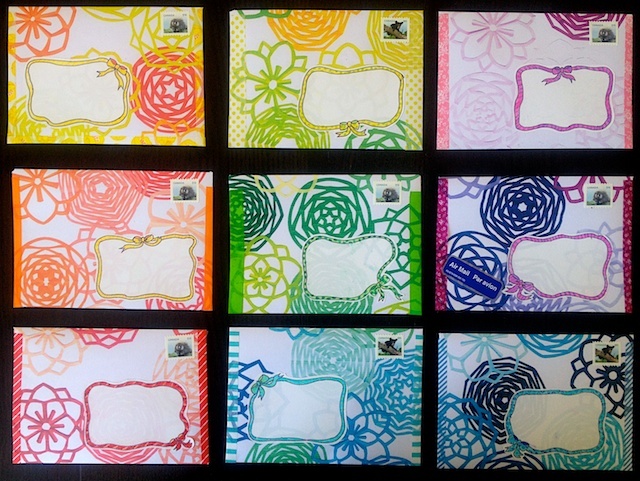 These envelopes are absolutely beautiful! I love the bright, bold colors. The matching notecards are a great idea. 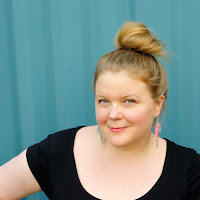 I've been following your blog for a few months now and it is my favorite! Also love your pinterest and Facebook. Can't wait until I can order from your shop. Thanks for being so inspiring! Thanks so much for the lovely comment Renee! So glad you like the envelopes! These are breathtaking. 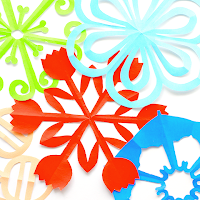 I don't think I could ever make such beautiful designs with kirigami (I'm terrible with scissors LOL!) but I definitely appreciate this. I have to agree it was a stroke of genius to color copy them with your printer like that. That's really cool! Genius! Love this! 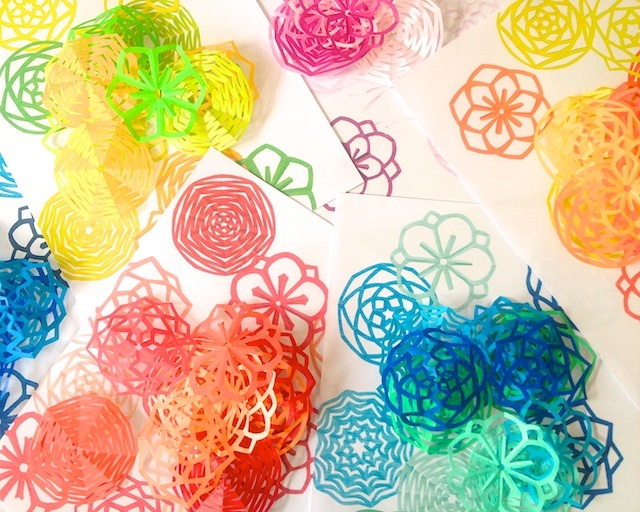 So pretty and doable (aside from the fact that my kirigami won't look quite as gorgeous and intricate!). 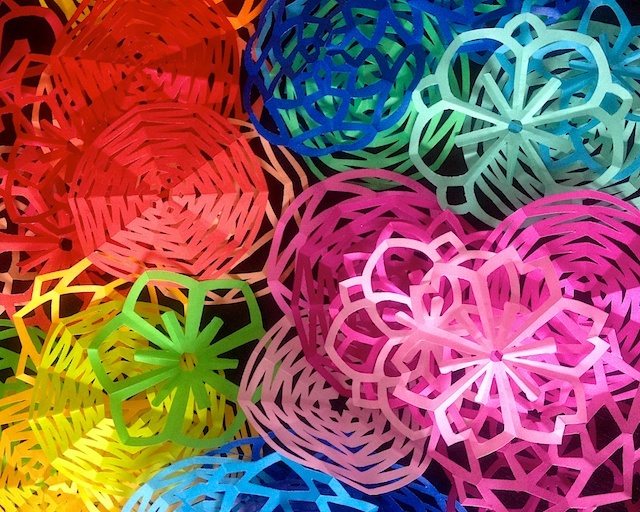 hi there , it's relly relly nice, what do u mean by "colour copies"did u glue the kirigami to a paper or scan them? Using an at home all-in-one inkjet printer, I arranged the kirigami pieces on the scanning / copy bed of the printer and used the "colour copy" function. You could scan and then print the scanned image, but I think it's easier to just hit the "copy" button.